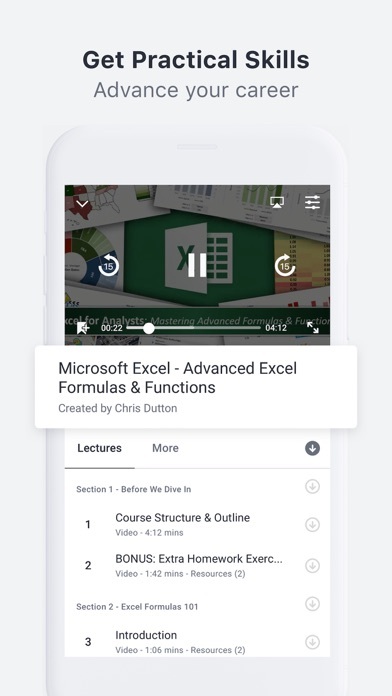 I downloaded a whole course but for some reason the app is deleting the video right when I make the selection to watch the video, rather than when I’ve finished watching the video. This means that there is basically no offline viewing of the material, even though I spent the time to download it. Please fix this bug. Also need an option to retain videos even after watching. The course I have recommends one go through watching and a second following along. With the setup now, I have to download each video twice, rather than just being able to download and retain until I’m done with them. Since I can’t find a way to leave a review for the Apple TV app, I’m doing it here. I cannot log in. One star. It’s that simple. Fix it and we’ll see. That’s BS. The service is a great experience AND investment! I just wished the UI on the iPhone XS Max were a bit more polished. It seems like UI features are starting to go away slowly and some elements can look a bit weird on the display. Great app otherwise, and don't miss out on their tons of sales! enable the customization please . This app offers the option to download videos to be watched offline, but it typically doesn’t work when offline and the UI turns into garbage when offline (it lists the same videos multiple times, frequently becomes non-responsive, and half the time I can’t play videos I downloaded, etc.). Unfortunately my main use case is watching offline, which the app claims to support. Loved Udemy up until the point they broke it with updates (iPad 2 version). Can't sign in on Apple TV. Both those don't recognize the password...but can sign in fine on a computer. Needs some attention to fix! Great courses but the app is horrible. The only reason to use the app instead of the website version is for offline downloading, but attempting to use that feature crashes the app. Please fix it app! 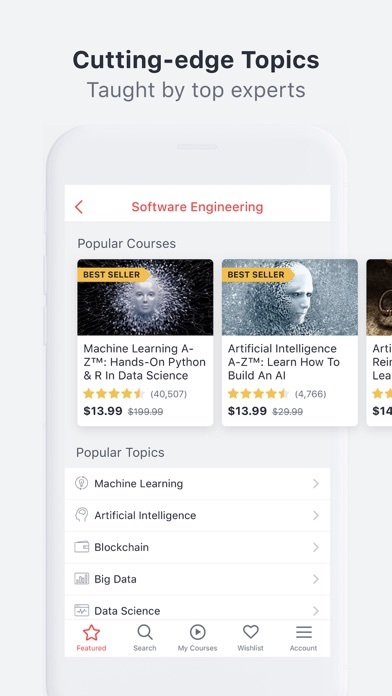 I purchase a lot course from Udemy, but the App so bad make me think twice before I invest more money into it. First problem - app keep signing you off almost everyday which is fine. But it really hard to sign back in. The password page won’t register the Go or Sign in button. I have to copy my auto sign in password then exit the app, then type my email then paste word then hit or Go key or sign in button. They need to fix this problem!!! Second problem - when you purchase new course from Udemy. You can’t find it in my course tab, you have to remember the course name. It had filter my last access course, but no new purchase course filter. You have to go Mobile browser access the website version Udemy filter the new purchase course, touch it open and watch one new course video first then it will show up on the Udemy app last access course. Third problem - course video got cut off, it not display the full video. I request long time ago and seems no one care to add this feature. 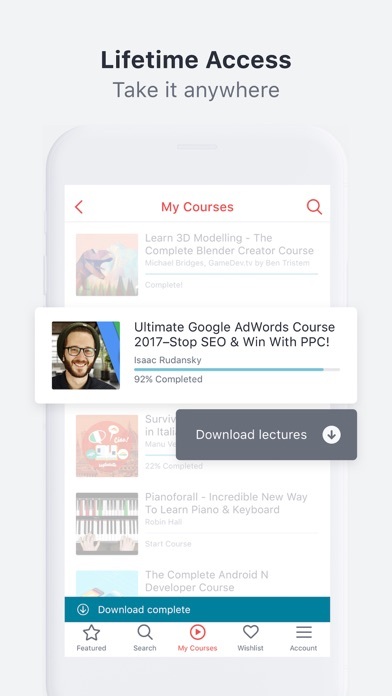 Udemy is a good service overall but the mobile app is terrible. 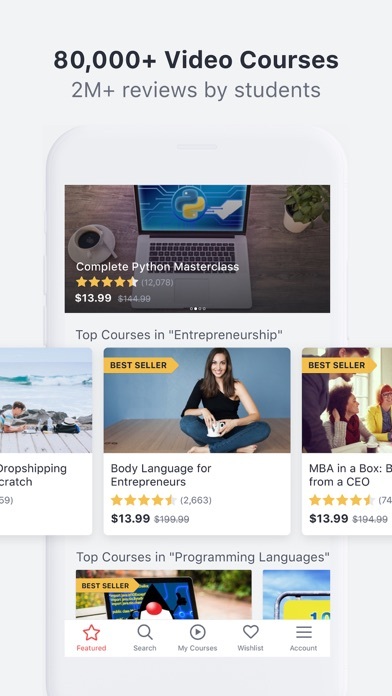 I like Udemy, their services have helped me out a lot in terms of my career. But, it only works when there is an internet connection. I downloaded the app in order to use the offline services. I have downloaded courses for offline viewing, but they will not play unless I’m online. Due to the nature of my work, I’m not always in areas with internet accessibility. When I have courses in my offline menu, but they do not play when I’m offline, then they are not offline accessible are they? Udemy has lied about their offline use and it is unacceptable! Fix the issue and I’ll delete this negative review.